Yes, I know I have been tardy in my posting. But, my return from vacation was met with a huge water leak in a wall line and a wonderful visit from my cousin from Italy and his lovely significant other. What a great way to spend my time–with the relatives, not the leak and subsequent clean-up. So, on with our travels and spice/herb education. I promised Cambodian or Khmer spices and herbs and here they are! 1. Kaffir Lime. The lime is small, very green, and has a bumpy skin. 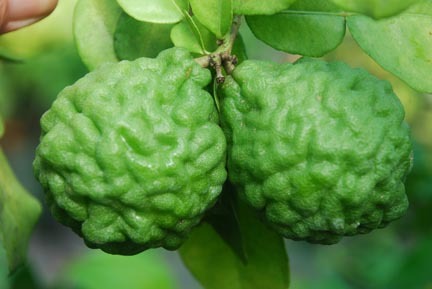 When Kaffir Lime is used in Khmer cooking it is only the rind of the fruit that is used. The leaves of the Kaffir Lime tree are used as well and are called Makrud. The leaves give your dish a definite citrus flavor! You will find kaffir Lime leaves used in many South East Asian dishes. 2. Rice-paddy Herb. This herb has a very lemony flavor with plenty of plucky tang. It is most often used in fish and seafood dishes. I have seen it used in salads as well. 3. Galangal. Many people mistake Galangal as ginger and it is from the same family. But, its flavor leaves a peppery, lemony taste on the tongue. After a few moments, I could swear I get a hint of pine pitch. Sigh. Just remember that Galangal is not ginger! 4. Taro Root. Taro is a tuber (root) that is very starchy and tastes like a potato with some lingering nutty after-notes. Taro is often used as a staple and a major benefit is that its starch has a definite purple color. When you see purple”ish” ice-creams and desserts in Cambodia, they are often colored with Taro starch. 5. Asian Coriander. Believe it or not, Asian Coriander is not related to the Coriander we normally know. It is from an entirely different family, but its flavor is like a stronger Coriander. 6. Water Spinach. Water Spinach grows in wet-lands and often the stems are picked just like asparagus. Also the tender roots are eaten as well. The taste of this relative to morning-glory is just like Spinach and it is frequently eaten in Khmer cooking. 7. Turmeric. Turmeric, or as it is known in Khmer, Kunyit, if most often used freshly grated from the root. Turmeric is used for color and to add flavor and aroma to curry dishes. Americans are most often used to powdered Turmeric, which, depending on its age, truly lacks the beautiful color and aroma of freshly grated Turmeric. 8. Star Anise. Star Anise, as we have learned, tastes and smells of licorice. Anise is used to flavor baked goods as well as savory dishes. When I lived in Viet Nam it was common for locals to chew the Anise seed as a breath freshener. 9. Jicama Root. Jicama Root has become increasingly popular in America and can be found in most large grocery stores. It tastes like a cross between a potato, an apple, and a turnip. I love eating raw root as it is quite sweet and crunchy. In Asian cultures Jicama is often substituted for water chestnut in stir fries. 10. Cilantro. As we discussed in an earlier post, Coriander and Cilantro are one and the same! The leaf portion of the plant is Cilantro and the seed portion is Coriander. 11. Tamarind. The Tamarind pod has a fruit whose pulp is, generally speaking, sweet. Thai Tamarind is quite sour, as are its leaves, both of which are often used in soups and stew-like dishes. 12. Finger Root. This root is considered a relative of ginger root, but is much milder in flavor. Interestingly enough, I have heard it argued that Finger Root is not related to ginger at all. Who knows! Finger Root is softer than ginger root and the skin is removed and the internal meat is julienned. You can rest assured that Finger Root will be found in most Cambodian curries. 13. Sweet Basil. As discussed in a previous post, Basil is a member of the mint family and is widely used throughout World cooking. However, I am told that the Thai variety has a subtle taste of licorice. I have never tried Thai Sweet Basil myself. 14. Lemon grass. Cambodian cuisine, and East Asian cuisine, widely uses Lemon grass herb. I personally do not like the flavor of Lemon grass as I find it reminds me of citronella candles and even a tiny bit too much leaves a chemical taste on my tongue. But, I must be in the minority on this as Lemon grass is a popular herb and the main flavoring in “Kroeung”, a popular Cambodian curry paste. 15. Angkeadei in Khmer or Sesbania Grandiflora in its scientific terminology is a bitter herb not used much outside Cambodian cuisine. We can say that Cambodian cuisine accepts bitterness in its cuisine as a sought after flavor. Both flowers and leaves are used in cooking. 16. Mreah or Bitter Melon. This plant’s leaf is often used to attain a bitter note in certain Cambodian dishes. Well, this has been a bit longer than I anticipated. I’ll let you all catch your breath, get on your computers and browse on-line East Asian groceries for Khmer spices and herbs. Later, you can fall asleep to the dreams of tropical jungles, foods of incredible color, friendly local peoples, and aromas drifting past on moist, warm breezes. I’m Back From Vacation With New Etsy Sellers For You To See! Loved vacation. A boost to my heart and soul. You will find the new artists on my page, “Etsy Sellers You Must See.” These are true treasures to view. Hats off to artists of every kind–you make the world a much better place. A Sneak Peak of Khmer Cuisine. Cambodia Here We Come. Hey there blog followers. I am heading on vacation and won’t return until June 14, 2010. Yeah. I can’t wait. Kayaking, hiking, photography, reading, good food and friends. Can we ask for more? Well perhaps you can. I will begin today with a tantalizing taste of our next destination–Cambodia. I lived in Viet Nam for three years and loved their food. 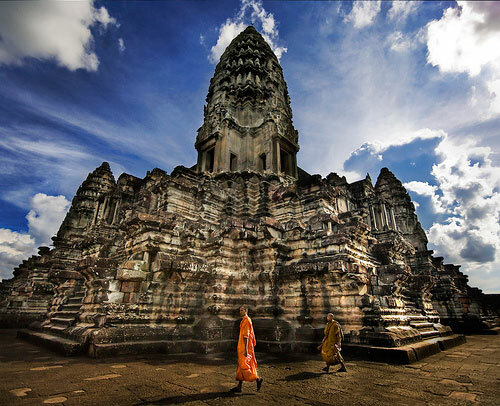 I plan on visiting Cambodia for the first time next year. I just have to see the temple photographed in Laura Croft, Tomb Raider. Additionally, I can’t wait to taste the dishes I’ve been preparing for years as made by the people who make Cambodia such a diverse and beautiful place. Here is a brief photographic glimpse of Cambodia. Well, I hope that holds you all until I get back in a week or so. Hope your summer is starting well and just think of the spices, herbs and recipes to follow. Cambodia promises to be an adventure!